Darien’s Nicole Carlo, shown in last season’s FCIAC championship, took second place on the beam against Greenwich on Jan. 12. 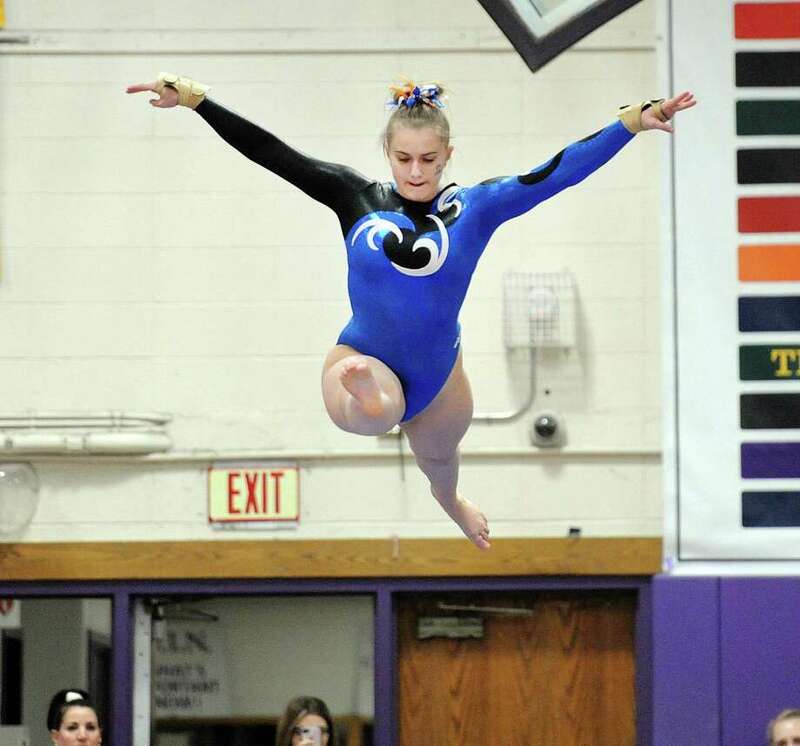 The Darien girls gymnastics team put its best step forward in the always-competitive FCIAC by defeating three-time defending FCIAC champion Greenwich 125.1-123.45 on Jan. 12. The Blue Wave used their depth to secure the victory. Darien senior Nicole Carlo took second place on beam (8.7) and floor exercise (8.35) along with third on vault (8.6). Junior Lana Schmidt was third on floor exercise (8.3) on her way to third place (30.5) in the all-around. Other Darien contributors included senior Lily Fairleigh (third on bars; 7.6) and sophomore Lucy Collins (third on beam; 8.2). Greenwich’s top two gymnasts, Gianna Cardini and Kelsey Fedorko, were 1-2, respectively, on vault and bars. Fedorko also captured beam (9.3) and floor exercise (9.2) on her way to the top all-around score of 35.0. Cardini was all-around runner-up at 32.4. The Cardinals were without the services of Ellie Marino, who is still working her way back from injury. CHALLENGING SKED FOR HAND: The Daniel Hand girls gymnastics program will be vying for its 11th consecutive Southern Connecticut Conference championship in February. The 2018-19 Tigers are taking an interesting path to the title meet. They are facing a greatly beefed-up regular-season schedule filled with non-league opponents. Daniel Hand, which was 5th among 10 teams at the Pomperaug Invitational, has lost thus far this season to Ludlowe (131.7-118.7), Warde (125.3-118.7), Glastonbury (133.5-122.5) and SCC rival Foran (109.3-108.7) on Jan. 17. Daniel Hand’s top gymnast from last season, Erin Naclerio, graduated. TEAMS ON MISSIONS: The Ludlowe girls gymnastics team was 6-0 heading into Friday night’s meet with Greenwich. Woodstock Academy is 5-0 after topping NFA on Jan. 16. The Centaurs have scored 146.85 points, 135.85, 139.8 and 144.1 thus far in their wins. The first set of rankings (based on five scores) are out for qualifying for the State Open Championship. The top 40 plus ties across the state qualify in the four individual events. The top 20 plus ties will qualify for the all-around. VAULT: 1, Ava Mancini (Ludlowe) 8.9750 point average; 2, Mia Lawrence (Mercy), 8.8875; 3, Britney Detuzzi (Old Lyme) 8.450; 4, Emma Nelly (J. Law) 8.4375; 5, Charlene Weaver (Mercy) 8.2750; 6, Claire DeMaso (Ludlowe) 8.20; 7, Paige Dean (D.Hand) 8.1750; 8, Mackenzie Powers (J.Law) 8.1625; 9, Cece Vess (Mercy) 8.1250; 10, Maria Denya (Old Lyme) 8.0625. BARS: 1, Mia Lawrence (Mercy) 9.00; 2, Britney Detuzzi (Old Lyme) 8.20; 3, Cece Vess (Mercy) 7.8125; 4, Ava Mancini (Ludlowe) 7.80; 5, Paige Dean (D.Hand) 7.7625; 6, Maria Denya (Old Lyme) 7.50; 7, Grace Rogers (D.Hand) 7.4250; 8, Emma Nelly (J.Law) 7.3375; 9, Chloe Ashton (Staples) 7.10; 10, Soleil Molesworth (Staples) 7.00. BEAM: 1, Ava Mancini (Ludlowe) 8.6750; 2, Claire DeMaso (Ludlowe) 8.40; 3, Maria Denya (Old Lyme) 8.1250; 4, Britney Detuzzi (Old Lyme) 8.0750; 5, Paige Dean (D.Hand) 8.05; 6, Mia Lawrence (Mercy) 8.0250; 7, Soleil Molesworth (Staples) 7.95; 8, Olivia Hurst (Ludlowe) 7.9250; 9, Alex Pereira (Norwalk) 7.85; 10, Cece Vess (Mercy) 7.7750. FLOOR EXERCISE: 1, Mia Lawrence (Mercy) 8.95; 2, Britney Detuzzi (Old Lyme) 8.8250; 3, Paige Dean (D.Hand) 8.30; 4, Ava Mancini (Ludlowe) 8.2750; 5, Olivia Hurst (Ludlowe) 8.25; 6, Claire DeMaso (Ludlowe) 8.20; 7, Kelley Levis (D.Hand) 8.20; 8, Maria Denya (Old Lyme) 8.1625; 9, Cece Vess (Mercy) 8.0625; 10, Emma Nelly (J.Law) 7.8750. ALL-AROUND: 1, Mia Lawrence (Mercy) 35.05; 2, Ava Mancini (Ludlowe) 33.975; 3, Britney Detuzzi (Old Lyme) 33.7125; 4, Paige Dean (D.Hand) 32.4125; 5, Maria Denya (Old Lyme) 32.1250; 6, Cece Vess (Mercy) 32.0; 7, Emma Nelly (J.Law) 31.4250; 8, Chloe Ashton (Staples) 29.8125; 9, Brooke Kustra (Branford) 29.8125; 10, Alex Pereira (Norwalk) 27.8750. Thursday, Jan. 24: Mercy at Hand, 6 p.m.: Must-see gymnastics in the Southern Connecticut Conference. Rematch set for February 14. Thursday, Jan. 31: Pomperaug, Newtown at New Milford, 5 p.m.: South West Conference rivals do battle. Saturday Feb. 9: Glastonbury at Norwich Free Academy:, 5 p.m. (at Thames Valley Gymnastics): Always an interesting contest when these teams get together. Tuesday, Feb. 12: Pomperaug at Hand, 6 p.m.: An intriguing non-league get together before the postseason meets.